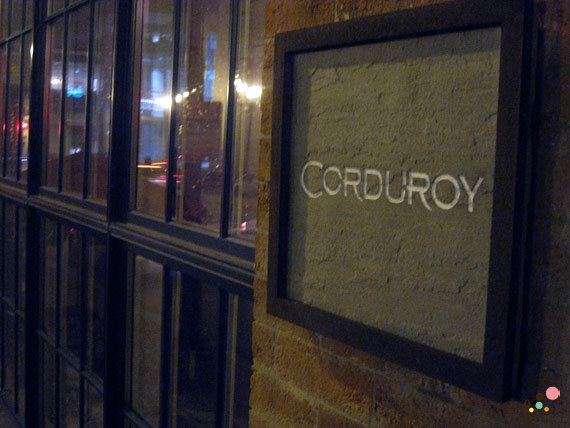 The last time I dined at Corduroy was almost 7 years ago when Corduroy was in a hotel downtown. I still remember how buttery and soft their sea scallops were. Since we are almost done with trying new restaurants in DC (it took a year and a half), we are starting to go back to the restaurants we tried before and like the most, and we picked Corduroy last weekend. 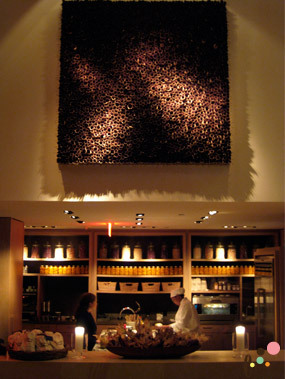 Now Corduroy is a stand-alone restaurant next to the convention center and it is very beautiful inside. 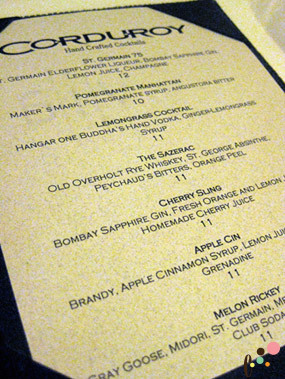 First, we sipped their special cocktail "The Sazerac" ($11), while studying their menu. The menu looked really good and I was very surprised the price was not over-the-top compared to other high-end restaurants (though there are some expensive items too). The first thing that caught my eye in the first course selection was "Noriko's shiso salad" ($9). I love shiso (Japanese herbs. Sometimes it is explained as a Japanese basil but it is quite different) and my mom's name is Noriko! Right away, I assumed it is was a Japanese dish and our waiter told me that it was the chef's mother-in-law's (also Noriko!) recipe. I really enjoyed this simple and fresh Japanese salad. The flavor is exactly what I was used to but even my husband liked it a lot. 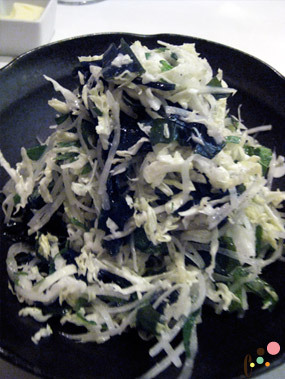 Lots of cabbage, wakame and shiso mixed with Japanese dressing. My husband's choice was red snapper bisque ($9). I am not a big fan of bisque - or I would say I have never had good one to make me love it. 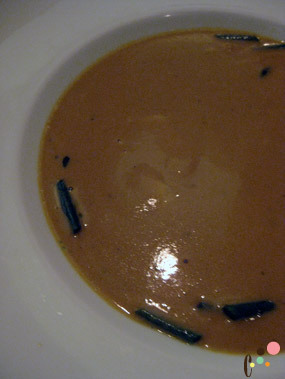 Unfortunately, this bisque did not make me love it again. I think my problem with bisque is saltiness. It is way too salty and I assume that is how it should be because they always are. 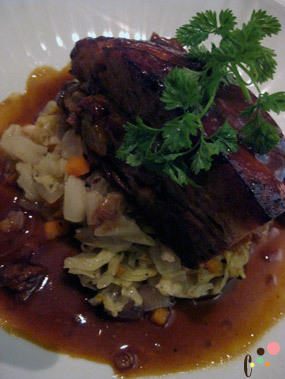 I won the battle with my husband to get the braised Niman Ranch pork belly with savoy cabbage ($26) for my main course. The pork was so tender and I loved the slightly sweet sauce. I always like the combination of pork and cabbage. They are so good together. 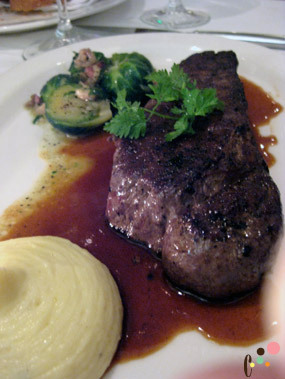 My husband got Vande Rose prime beef strip loin with mushroom sauce ($39). Yes, it was one of the most expensive items on the menu but he said it was worth the price. The meat was really soft and I could see the marble when he cut the meat. Besides, we took more than half of it home. 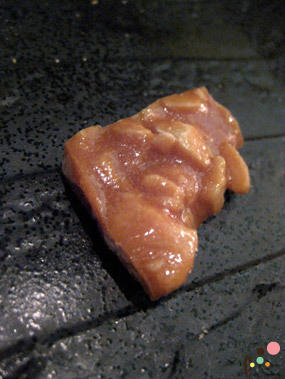 We skipped the dessert but we each had a glass of tasty dessert wine and they gave us a nut brittle which was really yummy. Our bill was a bit high, but as is usually the case, we could have made the whole meal a lot more reasonable but we always order too much drink. Oh well, but it was a great meal! My husband and I decided to celebrate our 12-year anniversary at Blue Duck Tavern, one of the few places remaining on our "must do" list. I felt very special about this place as soon as I stepped into the restaurant. Blue Duck Tavern is by far the most attractive restaurant in DC. 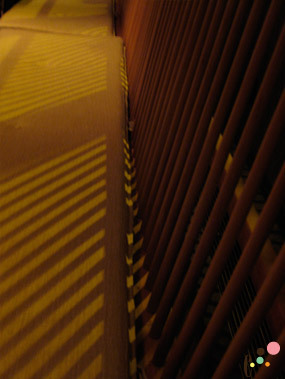 Every inch of detail in the restaurant is uniquely warm and beautiful. 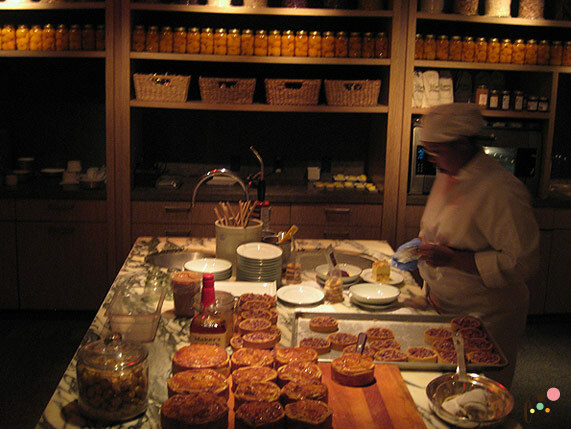 I love the open kitchen, a separate baking station with gorgeous jars filled with yellow peaches on the shelf, and the beautiful cheese case and tea room with a large glass jars of exotic tea. It looks like a set from a luxury cooking show. Even the furniture is special. 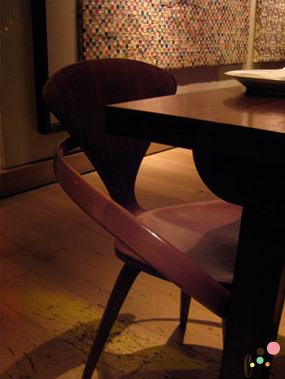 The table, chairs and benches are sleek, handcrafted wood. Later we were told that all the furniture was custom made by an Amish group nearby. Our waiter explained that their food is designed to share easily with others family style and we decided to have two appetizers, one main dish and one side to share. 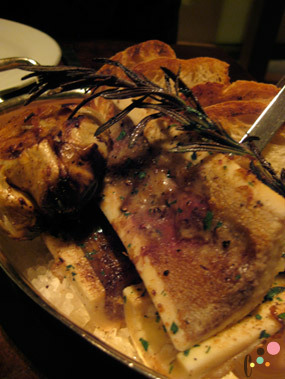 The bone marrow appetizer was a rich and satisfying dish even through the edible parts are very limited. What a unique idea. 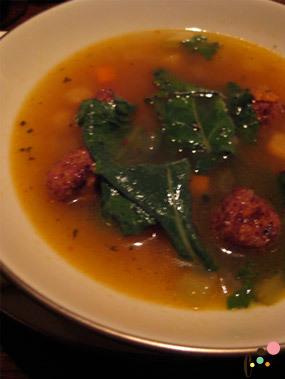 The soup was simple and light in texture but had a very rich in flavor. A perfect example of a great fall soup. And my potato-lover husband was very impressed with their triple fries. They were thick sticks that resembled a piece of fried tofu. The outside was crunchy but the inside was just like a baked potato. And my favorite dish from this dinner was the pork chop. 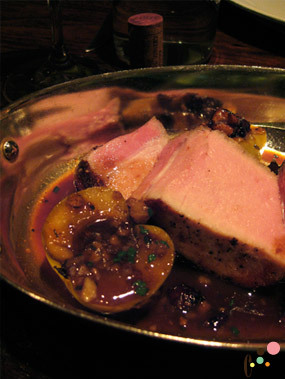 The softest pork chop I ever had, apparently the result of a secret brining process. It came with a nice rich sauce but the pork itself had so much flavor it hardly needed anything else to enjoy this meat. 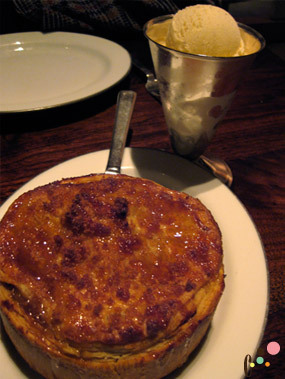 And of course, needless to say, their famous apple pie with homemade ice cream was yam (I wish the apple pie was a little warmer, though). 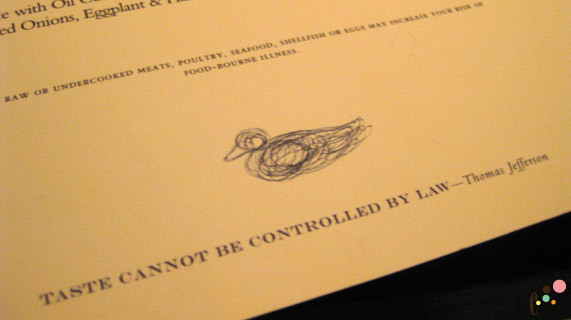 Blue Duck Tavern certainly met - even exceeded - my expectations. 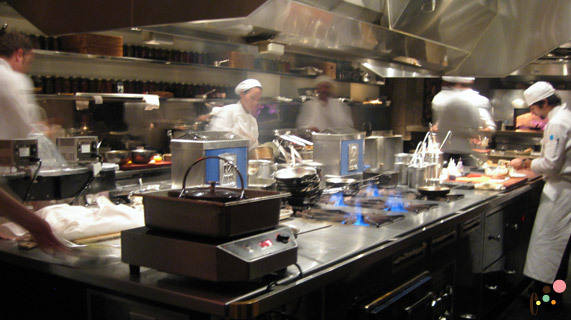 It is a great place to have a wonderful meal in a beautiful ambience without being too complicated. All the food we tried was very straight forward but prepared with great care. After three failed attempts to get a reservation during restaurant week, we finally broke down and decided to go to Bourbon Steak full price. Because of the World Bank Conference, the hotel was busy and lively and of course the restaurant was packed with people. I liked their modern, cozy atmosphere with spacious tables. As soon as we sat, the waiter brought the complimentary duck fries. They came with three different flavors with paired sauces. They were delicious. However, to be honest, they really ruin the rest of the dinner by filling you up before you even start. Likewise, the waiter then brought a huge mound of amazing truffle dinner rolls. 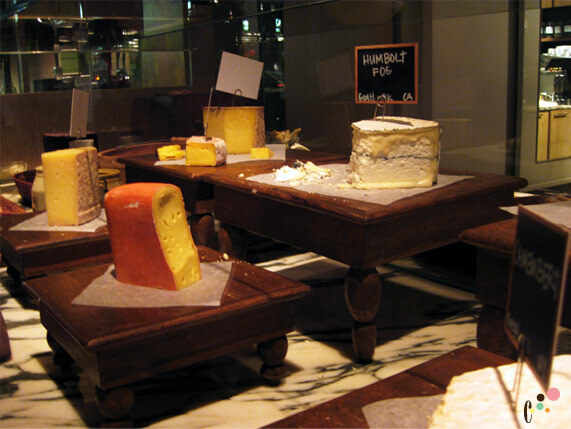 The rolls were packed with black truffles and loaded with butter to make them irresistable. So irresistable that I was completely full by the time even the appetizer arrived. This is a meal meant only for very heavy eaters. 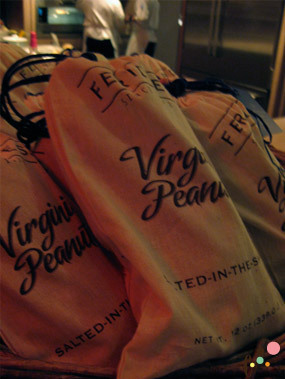 Finally, our first course arrived (along with our drinks ... another reason the fries went town roughly). A chicken liver parfait with pickled vegetables. The chicken liver was very creamy and mouse-like. 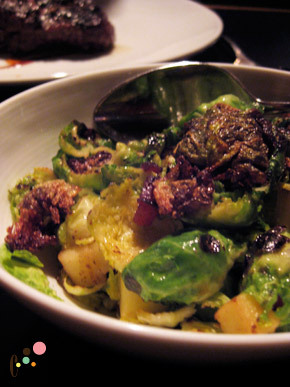 Very rich but with pickled baby vegetables, it was a nice contrast. 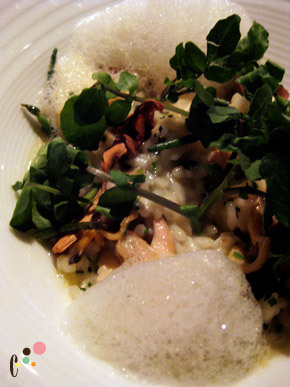 I had a Colorado Matsutake risotto for my main course. It was much lighter than I expected (especially after the starters) with a distinctive matsutake aroma. I grew up eating lots of Matsutake this time of the year. Since it is hard to find them in the US (at least in DC), I was very happy to eat this. My husband got a New York strip cooked medium rare. It was cooked perfectly and he seemed to be very happy with his choice. Unfortunately, he couldn't even finish 1/3 of the dish. We took rest home for a steak sandwich the next day. 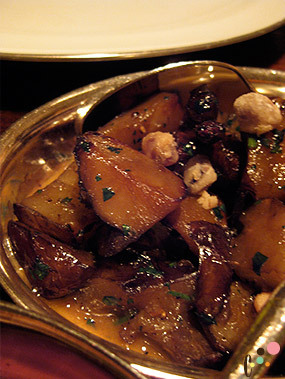 We loved both side dishes. 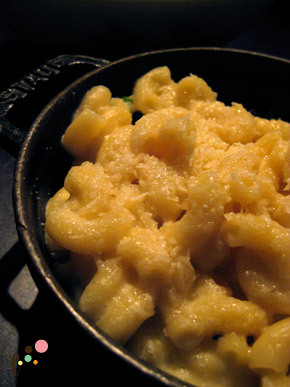 The mac & cheese was very creamy and truffly and I loved it. A small scoop is just enough so it would be perfect to share with others. 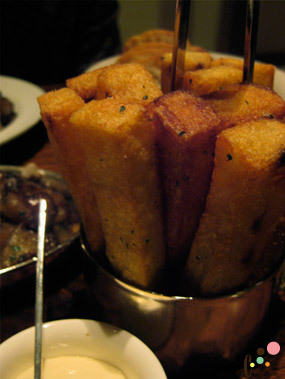 Overall, I think everything including fries and bread were great as an individual dish. However, as a whole, it lacks a sense of balance because they offer too many rich items and large volume mains. Even though I had an appetizer-size risotto for my entree, I couldn't finish it. 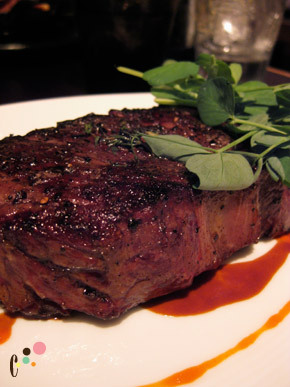 Another drawback of course is the price, but that is just what I would expect from a steak house in the Four Seasons hotel by Michael Mina. 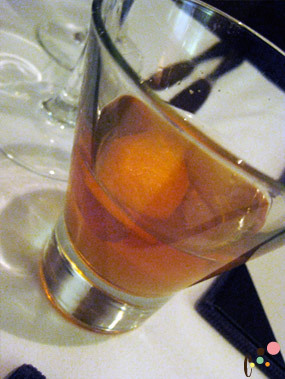 Next time, I would love to try their bar menu which seems to be a better deal at least for modest eaters like me. And I know people are raving about their burgers. I am especially interested to try the Falafel burger and KFC (Korean Fried Chicken).